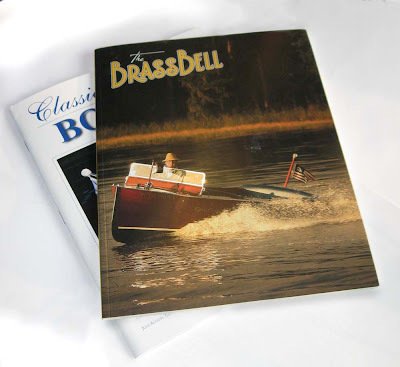 Screw The Bad Broadcast News, My Brass Bell And Classic Boating Magazine Are Here! So there I was, sitting in front of the TV watching the gloomy news after a day of having the crap beat out of me by frustrated clients regarding the bad economy. The news is spouting how the sky is falling, and gas prices are soring. I am looking up to the ceiling looking for a good strong beam, a chair and rope. Just then my beautiful bride walks in with the mail, I see the familiar glimmer of plastic wrapped magazines. Yes 2 of them. Could this be just a cruel joke, Did the landsend catalogue all of a sudden decide to wrap there magazines… Noooooo. It was my new Brass Bell and Classic Boating magazine. Daaaaaaaaang! Life is good, once again the passion of Antique & Classic Boating has helped me relax. Just me, in the bathroom and my classic boats… Thank god I am so full of crap! A Funny Thing Happened On The Way To The Bank Yesterday! Jimmy's Marina & Lounge Gets A Sign!